The other day Ma shared this photo of me on the couch. I have an 80s hairdo. A couple of the comments mentioned I could really use a haircut. Little did they know, she had already made me an appointment. Ma says I should have been born in the 80's. It was the era of big hair. The person I used to go to has opened her own grooming shop and boutique. 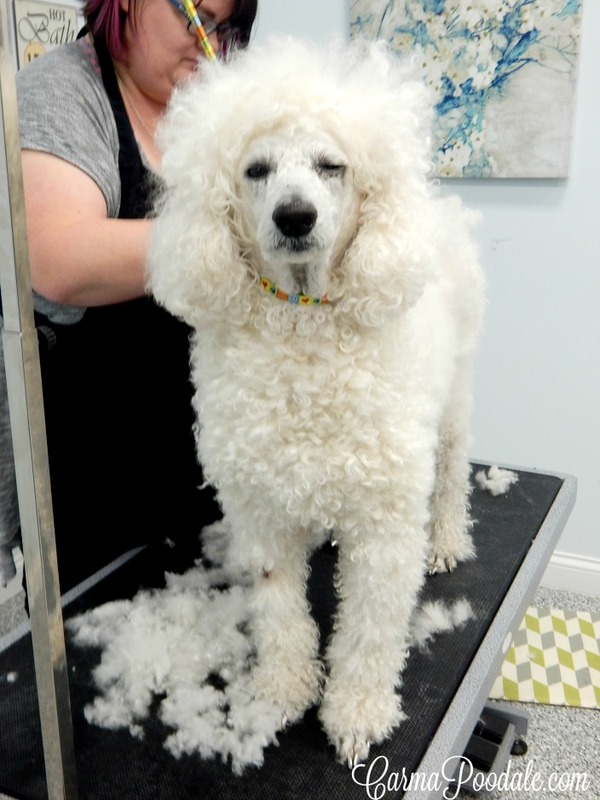 She is the co-owner along with another groomer I used to use. Emily has been grooming for almost 20 years and Megan has been grooming for almost 10 years, it was time for them to put their experiences together and open their own shop. We loved all the assortments of items they carry in the boutique. They have locally sourced, safe deer antlers, orthopedic pet beds, shampoos, clothing, and much much more. I couldn't show you photos of everything. You need to go in and see for yourself! As I was saying I was sure a hot mess. No matter how much ma brushed me, my hair still looked wild. Emily took one look at me and said she would make me feel better. She wasn't kidding! I feel like a new Poodle. It is so spacious! Love the decor. It is a spa for pets. The grooming area has plenty of room. Even if multiple pets are in there (yes they do cats too) there is still room to move around. They have different tables for different needs. 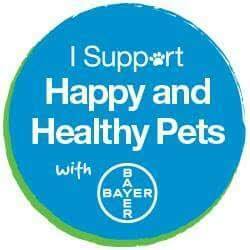 They also have drying areas for all size pets and never use hot air. They take your pet's safety seriously. 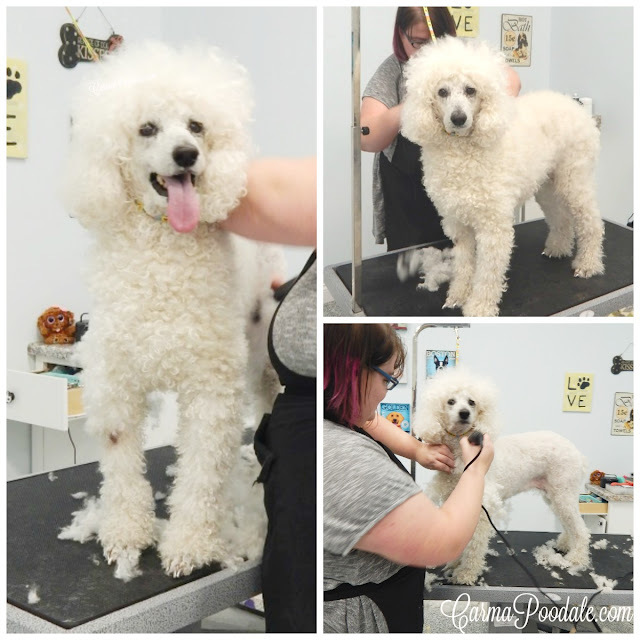 Since both groomers are pet mom's, they treat your pet like they were their own. The bathing area also has different size tubs for different size pets. The tubs are deeper than most grooming places. It is safer. They allow you to sit down if you need to. My back was bothering me a little before we got there. Emily washed my back half at the start of the bath, this way I could sit while she washed the rest of me. I couldn't help but smile. The water was perfect, the massage was wonderful and the drying time made me happy. 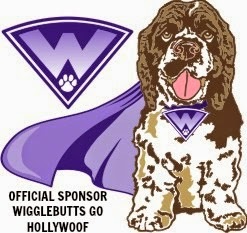 I was feeling better because of that massage, was the better than a chickyum jerky! Once I was dry it was time to get that hair off. I kept smiling with each run of the clippers. I started feeling cool air. THIS IS GREAT! After a while (as you can tell in the photos) I was wanting ma to go away. This was my groomer and my time together. 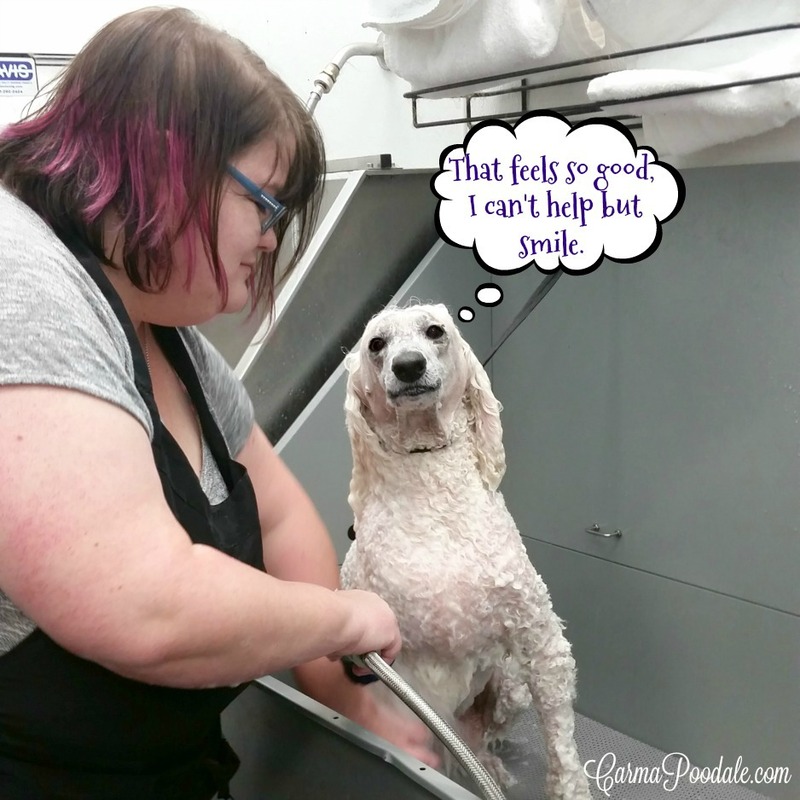 You can watch your pet be groomed but sometimes your pet just wants you to go away. I look at it like a groom seeing his bride for the first time. Do you want your groom to watch you get ready? How fun would that be? NO! You want to surprise them with the finished look, right?? Ma talked with Emily about the choice of shampoos, conditioners, grooming concerns and about services and more. Conditioner are as important to a pet's coat as it is to a human's hair. You want to put the moisture back in the coat. I gave her my stern stinkeye. She knows that look. It is the look of leave me alone. Go AWAY! She took the hint and left to go look around the boutique. Bout time! 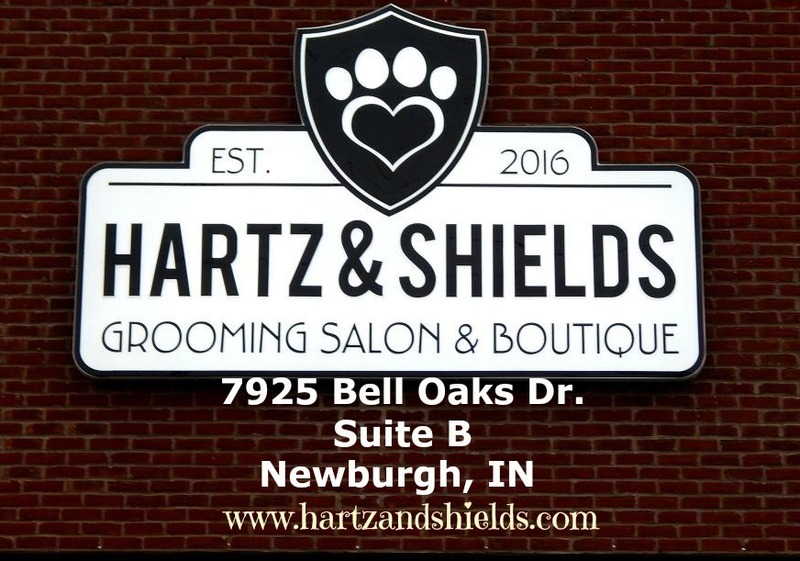 Hartz and Shields can take care of your grooming needs. They also do cats and have walk-in services. 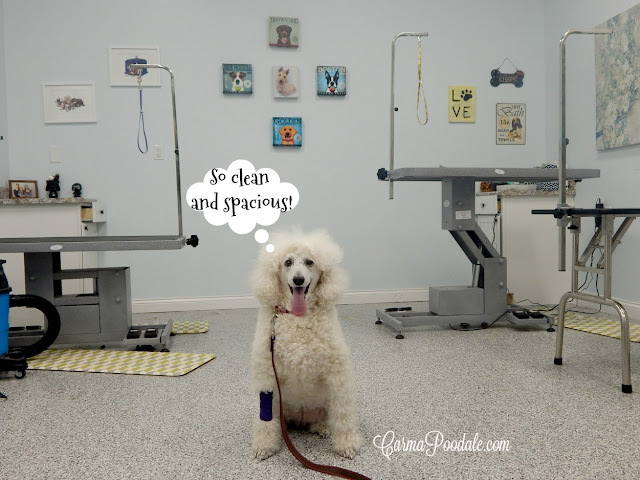 Does your pet only need a bath?? I have friends with large dogs who have their pups bathed only. Maybe the dog is too large for their tub or they don't want to deal with all the washing and drying. This is a wonderful service. Ma has even wished she could take me in just for a bath and blowdry. 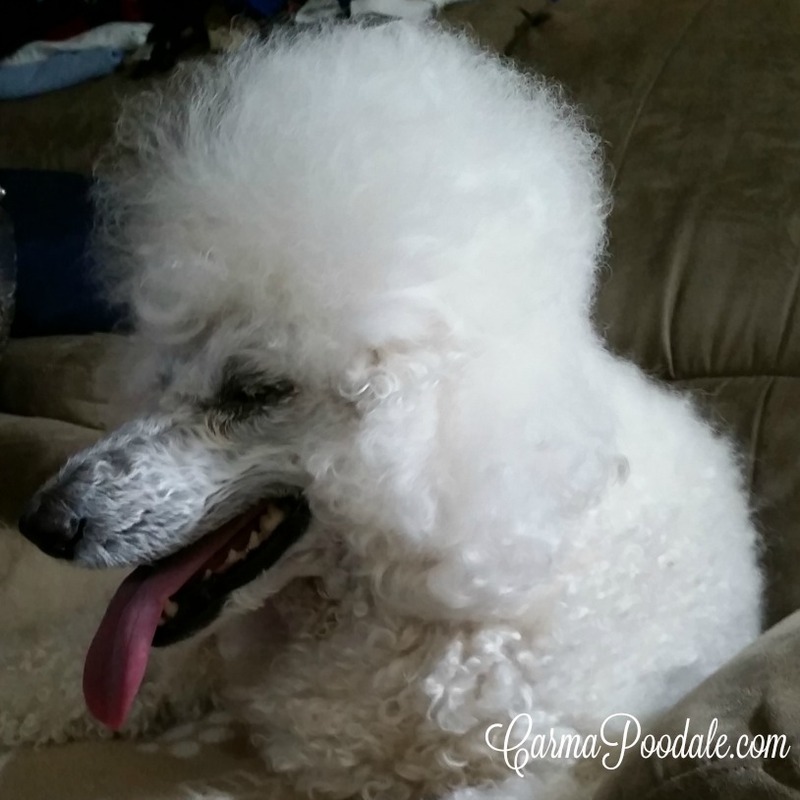 She then talks herself out of it because with a poodle, you might as well get a total groom. It may not be that way for other breeds. Dog or cat doesn't like to get a bath?? They will do it for you! You can visit their website to see all the services they offer and even schedule an appointment. 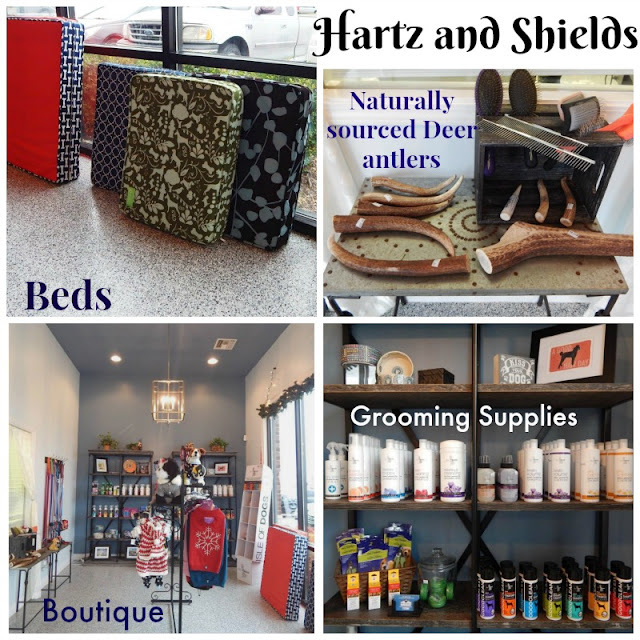 Stop in and see the selection in their boutique. While you are there, meet the owners. I ALWAYS recommend meeting the groomers before scheduling an appointment. Ask questions! Have a question about your dog's coat? Emily or Megan can help you with that. 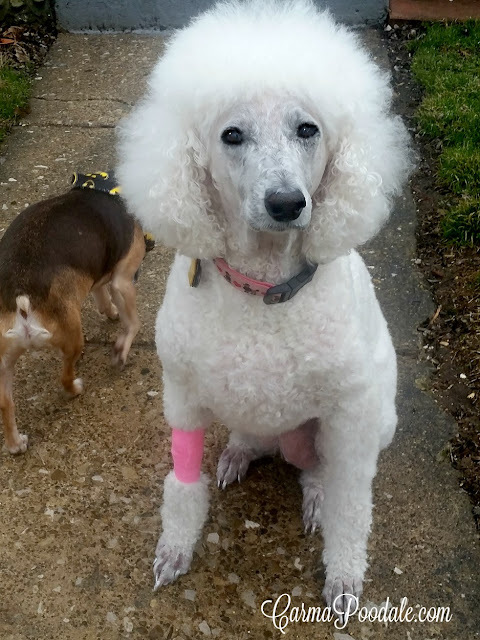 Want your pet to get a new look? They can do that too! I have known both of these groomers for a long time. You might remember me writing about a special groomer who took the time to earn my trust after I had a bad grooming experience. Emily is that special groomer. She took her time letting me get to know her and her to get to know me. Sometimes I think she knows me better that I know me!! She talks to me like I was her own. I try to be bratty (YES, I can get BRATTY/Diva-ish) She says "Now Ms. Poodale, you don't want to be here all day,now do you?? Let me finish and you can go home." Works everytime, I have a couch that misses me. BOL! Seriously, all jokes aside.....Hartz and Shields Grooming Salon/Boutique has earned my #PoodaleApproved stamp. It's not easy to please a Poodale nor is it easy to please my ma. We were both pleased with the experience, atmosphere, openness, and all around experience. I will definitely be back. My leg has a wrap on it due to me wanting to lick a bump that was there. Ma keeps it covered so I don't irritate it anymore. Do you think I look better? No more 80's chick? I can still like the music right?? You look wagnificent! Wish Sam's pom on top of his head looked half that good. The rest of his body is super thick but the head, not so much.